-16 year old Niti Majethia, Amazing Award Winning Writer. We all have a passion. Something that shapes our lives and something we cannot live without. For Niti, that is writing. In the span of only a few years, Niti has gone from writing short poems to being on the fast track to publishing her own book. 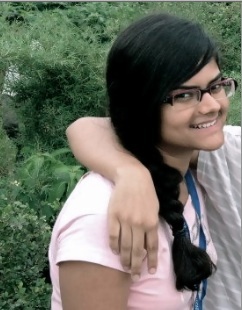 Amazing Kids is pleased to announce Niti Majethia as our August Amazing Kid of the Month. Keep reading to learn more about Niti’s writing, and how you too can break into the publishing world. Niti Majethia dreams to be a famous poet and writer. While the sentence may be a simple one, it is no easy task! Niti grew up in a literature rich house in Mumbai. “My parents are not writers, but they love reading so there was this atmosphere of literature at home,” Niti said. She wrote her first poem at age 6. Quite an impressive feat indeed! Writing on and off whenever she felt inspired wasn’t enough for her though. While she is only 16 years old, Niti makes it a habit to write everyday, no matter how busy she is. And her hard work has paid off. Niti has been published in her local newspaper, Robinage. She has been published in various American magazines like Skipping Stone. And she has won awards from Kidspirit, the same magazine that she is now an editor for! Congrats Niti. 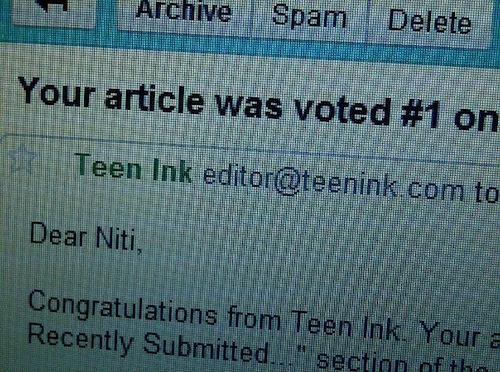 Two of Niti’s poems have been voted #1 on teenink.com. “I know exactly what I want, and I don’t give up until I get it,” she said. Kidspirit, based out of New York, is an online teen magazine that provides a publishing outlet for kids around the world. After Niti’s poem “After I die” was selected, she was invited to New York to receive her award. She calls this award ceremony one of her most rewarding experiences. 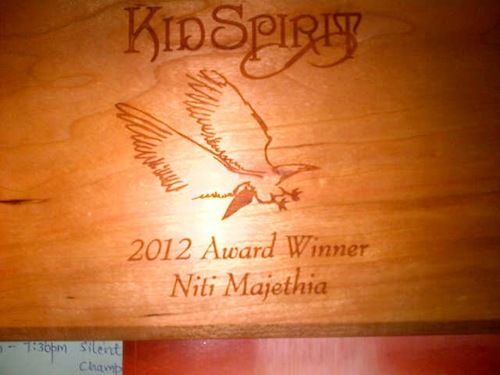 Here is the award Niti received from Kidspirit! At the ceremony Niti got to read her poem for all of the guests. She met the Buddhist priest and author Mr. Lama Surya Das, met a film producer, and met the New York Kidspirit editors. At the award ceremony, Niti was also asked to join the Kidspirit editorial staff. Soon after, Niti set up her own editorial board for the magazine based out of India. After months of getting to know perspective board members, Niti now has an editorial board that consists of six people! Congrats Niti! As an editor for Kidspirit, she gets to help distribute columns to other writers and makes sure deadlines are followed. Niti also edits submissions and makes sure all changes are implemented before the pieces get sent to the New York board. “I write poems, prose, and general pieces for columns. I also edit my own work, and other people’s work,” Niti explained. As any writer will tell you, one of the hardest parts isn’t sitting down to write. It’s making that big break and getting published. For Niti, she used to spend hours researching different magazines that would accept work by children and emailing editor after editor. With that came a few rejections, even rejections from the people around her. However, she urges other young writers not to let this discourage you! “I realized that if I had let those knives hurt me and if I had given up, I would have never won these awards and gotten recognized. I would have never been an editor in one of the world’s top magazines for teenagers,” Niti said. For all of our aspiring writers Niti has some advice! you are a real poet. Niti hasn’t let the fear of a few rejections scare her away from her dreams. She is currently writing a book, and wants to make a perfume. Niti is truly one inspiring writer! Below is one last original poem she has written for us! the ripples translate it into words. until we pour it out. this is life to me. This is the mechanism of art. it is waiting for you to say something.